Supporters hope to pass the measure before Democratic Gov. 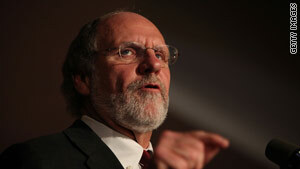 Jon Corzine leaves office. Democratic backer: Students "should pay the same as their counterparts"
(CNN) -- Both houses of the New Jersey legislature plan to vote Monday on a controversial bill backed by Democrats that would qualify illegal immigrants for in-state tuition at public colleges and universities. Supporters hope to pass the measure before Democratic Gov. Jon Corzine leaves office. Gov.-elect Christopher J. Christie, a Republican who takes office January 19, has said he opposes the bill. On Thursday, a Senate vote on the legislation was postponed. After hours of heated debate January 4, the bill passed the Assembly Appropriations Committee, 7-4, and the Senate Budget and Appropriations Committee, 8-6. Both votes were along party lines. To qualify under the bill, New Jersey high school graduates who are illegal immigrants must be enrolled at a public university or college and file an affidavit with the institution stating that they have applied for legal immigration status or will do so when eligible. If signed into law, the bill would be the 11th of its kind. There are similar laws in California, Illinois, Kansas, Nebraska, New Mexico, New York, Oklahoma, Texas, Utah and Washington. In 2008, Oklahoma ended its support for in-state tuition for students who are in the United States illegally. New Jersey Assemblyman Samuel Thompson, a Republican, said the bill discriminates against U.S. citizens who attend New Jersey colleges and universities but don't live in the state. Thompson believes illegal immigrants do not have the right to a reduced tuition. You can call it undocumented, you can call it whatever you want. But you are not legal and you are not entitled. "You can call it undocumented, you can call it whatever you want. But you are not legal and you are not entitled," Thompson said. Assemblywoman Valerie Huttle, a Democrat, expressed frustration with misconceptions of the bill that label it as a "free ride" or "state-funded" education. "These students have been here for decades, have gone through the school system here and should pay the same as their counterparts who have gone through school with them," she said. G. Jeremiah Ryan, president of Bergen Community College in Huttle's district, supports the bill. "The undocumented kids have a tough time anyway. They're really good about going to class," Ryan said. "Then they stop because they can't afford to go to a four-year institution." The New Jersey Office of Legislative Services said the bill would not affect state revenue because the state does not collect revenue from public colleges and universities. It is estimated that the bill's provisions would increase the number of illegal immigrants applying for admission. Assemblyman Michael Carroll, a Republican, questioned the validity of a bill that improves illegal immigrants' access to education when their illegal status prohibits them from giving back to the state in a meaningful way. However, proponents of the bill believe that the young students will be resources for the state. Democrats say that the backlog in applications for citizenship is the real culprit and that the controversy highlights the need for immigration reform on a national level. These students have been here for decades ... and should pay the same as their counterparts who have gone through school with them. Daniel Hurley, director of state relations and policy analysis at the American Association of State Colleges and Universities, agreed. "New Jersey could be the tipping point in terms of energizing Congress to put immigration reform higher on the agenda," he said. Hurley cited a lack of legislative activity regarding in-state tuition for illegal immigrants in the past few years and applauded the New Jersey legislature. The legislation is the path to a more rational policy on education and immigration on a federal level, he said. "These men and women are not going back to their native homeland by and large; they will be staying in New Jersey and the U.S. The question is: Do we want to facilitate their education and professional aspirations so they can contribute civically and economically, or do we want to prevent that?" Hurley said. "They may very well become a liability." Thompson had blunt words for immigrants whose illegal status he felt nullified their right to education, "Go back home, apply, come legally, and I'll welcome you with open arms." However, students who have lived illegally with their families in the United States see the opportunities the bill would give them. One such student -- Aura, who would only give her first name -- has been praised by teachers for her high grades. "This bill would just make our school dream possible. They're not giving it to us for free," said Aura, who is now a U.S. citizen. "If they open up this channel for us, we'll do the rest."